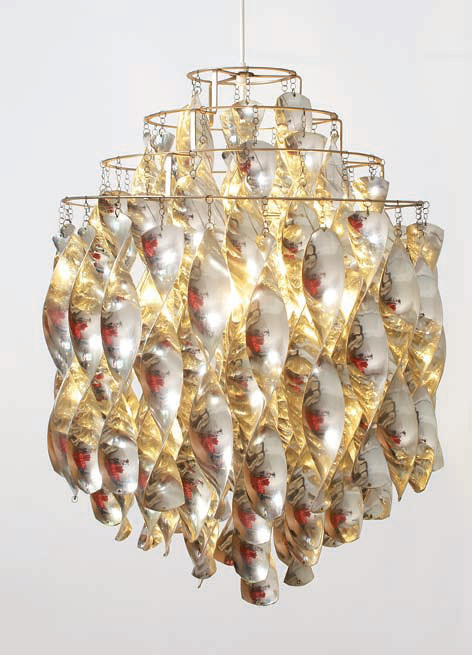 Panton lamps are not just Panton lamps. Panton lamps are lifestyle pieces, treasures and an eternal reminder. Panton speaks so strongly to his fans, which is why Lauritz.com has decided to write this article that describes what Panton lamps are. Verner Panton developed a special group of lamps that were produced by J. Lüber in Basel, Switzerland, where he lived from 1963. Fun is one of the Panton lamps, consisting of round discs (mother of pearl or aluminium) that hang in tiers around a bulb, covering it so as to avoid glare. The individual discs are suspended above one another in small round metal rings and the tier effect is achieved by the discs being hung from a metal framework in a rhombus formation. In another version the rhombus are hung in long chains from a ceiling plate. This gave Panton the opportunity to make large constructions, where up to three 'spheres' of mother of pearl discs create a lamp which cascades more than two metres from the ceiling. The Fun lamps give a slight, tinkling sound when a slight breeze touches the lamps. The mother of pearl version was launched in 1964 and further developed in countless versions in following years. Fun is exceptionally spectacular among Panton lamps. Also Verner Panton’s spiral pendants, following the same design principle as the the Fun lamps, were originally produced by J. Lüber in Switzerland. Lüber was involved in producing the special Panton lamps that were decidedly organic in their design language. When regarding Panton lamps such as these it is not surprising that Panton was often considered an outsider among well-known Danish furniture designers, as both his design language and colour choice were far removed from more traditional design. When the Spiral pendants’ various long spirals turn on their axis the entire lamp comes to life as the room and light are reflected in the spirals. Many of the designs that today characterise Panton lamps are once more in production, at Verpan, in collaboration with Verner Panton’s widow, though not in all colours and models. lamp and so also belongs to the group of Panton lamps for which Verner Panton has taken geometric expression and language of design as his point of departure. 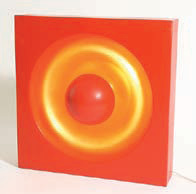 Panthella is a simple and elegant lamp that is not quite as futuristic inspired as Verner Panton’s other lamp designs. This Panton lamp resembles a mushroom and is almost a sculpture in itself. The light source is hidden underneath a milky white, hemispheric acrylic shade. The white-lacquered trumpet base complements the form of the shade and reflects the light, thereby contributing to the beauty of the overall design. The more special details in the design are the small ball placed at the top, which can be screwed off in order to change the bulb, and also the hole in the base of the lamp where any excess cable can be stored. 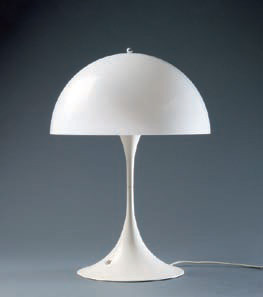 This model among Panton lamps was also available as a standard lamp and was introduced in a variety of versions, e.g. in polished chromed acrylic or with green, grey, orange or red shade and chromed base. Today only the white version is in production. Panton lamps can much more than just light up a room. Lighting was an important part of the overall impression in Panton’s interior concepts. In this connection he developed a number of different wall modules containing lighting. A common feature for these wall lamps was a distinctly geometric design idiom - a point that Verner was both loved and criticised for. They can be used both on walls and ceilings and come to their full effect when they are mounted in larger units, e.g. over a whole wall, where they function as wall reliefs when the lamps are turned off. Both the wall modules that were developed for the German news magazine headquarters, Der Spiegel, and the Ring Lamps that were developed in connection with Visiona 2 are square in basic form and relief-like. However, when the light is turned on the expression changes as the three-dimensional character of the lamps comes to the fore and their soft light contributes to an almost cave-like atmosphere.